Time has a way of marching on in spite of us. In schools, the clock on the wall is either friend or foe. 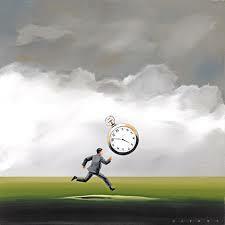 Time can propel us or it can paralyze us. I’ve had a life long love-hate relationship with time. I’ve tried to master it, manage it, conserve it, speed it up, slow it down…the list goes on. A wise mentor used to laugh at me and tell me that I needed to be more playful with time. Play with time? How can you play with something that is always moving, never still? While I couldn’t see it all those years ago, my mentor was right. You really can play with time. It’s in the very forward motion of time that the beauty of time playfulness lies. At that point in time, he knew something I did not: time is only scarce if we think it is. I used to think of time as my enemy – it grinded me and wore me down as I constantly tried to battle and slay it. There was never enough time, and worse still, there was no way for me to somehow get more of this fleeting trickster. another. A typical school day is approximately 6 hours long. Factor in recess breaks, lunch and transitions and there are about 4.5 hours of quality learning time in a day. How we play with that time is essential. You know you will see your students for a finite portion of their learning day so you have some choices to make about how that time should be invested. To play with time, focus first on the big picture before you start dialling it down to daily specifics. Think about all of the factors that might pull away your time…relational issues that need resolving after recess, assemblies, accidents, unexpected events like fire drills, absences, etc. Stuff happens in schools – there are a lot of variables that can’t be planned for or controlled. Leave room for these and focus on the time you DO have. 2. Clarify priorities. Knowing your curriculum well is the first step to knowing how to prioritize learning time. If you aren’t sure where you are going, how can you decide where to make curricular time investments? Be realistic when you decide on your curricular priorities. Real is not always ideal, and as Saunders puts it, “reality always wins.” Educators tend to have a bent towards the ideal, and in doing so, we lose sight of what is real. Plan with reality in mind – who are your real students (not the ones you imagine)? How much time do you really have (not how much time do you wish you had )? What is really worth knowing and doing? Decide what is essential – less is more. When we put the less is more principle into practice we can make wise time investments that bring playful learning yields. We leave room for learners to have the time to play, explore and inquire. We model prioritization for our students – a pretty necessary skill in today’s fast paced, time challenged world. 3. Habit Patterns Rule. Establishing routines and systems creates stability and security. When you feel stable and secure, fear is replaced by playfulness. One thing I’ve learned is that kids thrive on routines – not rigid routines, but consistent and predictable routines. Predictability creates the space to for spontaneity. Spontaneity invites inquiry. Inquiry invites motivation. Motivation invites learning. Learning invites growth… Habit patterns also enable us to make informed choices when setting priorities. (See #2) How often do we “fly by the seat of our pants” in the classroom? When there is a lack of routine, we lose sight of priorities, and we are right back in the trenches fighting the war against time. Our relationship with time has significant impacts on how we approach every aspect of teaching and learning, from deciding which learning outcomes will have the highest priority, to how much time learners will need to spend on a task or engage in a learning opportunity, to how much room there is for students to engage in inquiry and reflection. If we are hurried, our students will feel hurried. If we are weary, our students will feel weary. If we are playful, then our students will feel playful. How will you invest your time, so that the learners in your classroom will see the value of how they invest theirs?